Like you, I am an awakening woman. I am also a mother, a leader, a mystic, a celebrant, an intuitive coach, a daughter, a nurturer, a wife, a friend. Someone to whom connection, authenticity, vulnerability and courage are the most important things in life. I am passionate about life and believe it can be a rich, fulfilling journey when we are able to open our hearts and minds to new ways of being. I also know from personal experience how painful it can be to change behaviours and beliefs that have kept us safe. The women I serve are women with a purpose, healers, pioneers, intuitives. They are women who are changing the world by healing themselves from the inside out. This work requires tremendous passion, courage and perseverance. It also requires support. We cannot do it alone. It is a peculiar truth that those of us who most long for connection are those who feel most alone, who find asking for and receiving what we need so painfully difficult. Often we have experienced deep trauma as children that keeps us stuck in fear. For me, friends, therapists, mentors and teachers have helped me and held me as I have worked through my own trauma from being separated from my Mum at birth, from losing my Dad at only 13, from living with an alcoholic for a husband, from being a sensitive and intuitive child in a harsh world where such things were ridiculed and driven underground. Yet these are my super-powers! As I claim each and every one of them more fully and heal the trauma through tears and anger, dance and yoga I am able to truly serve you as an awakening woman. For your super-powers are there too, disowned in your childhood, waiting for it to be safe to re-emerge into the light. I am here to serve you as your midwife in birthing these super-powers, these gifts that only you have to offer the world and then in sharing them freely so that you can experience deep fulfilment and abundance. When I work with awakening women I come more fully alive, as if something magical is flowing through me. This magic inspires them to try things they might not have tried alone. To keep it flowing I have had to learn to tune into my feminine body, to speak my truth, look after my own needs and trust both my intuition and my gut instinct. Now I take great delight and honor in passing my experience onto you, so that your struggles may be eased by the path I have forged. It is not for the faint-hearted but the rewards are the miracles I see in my life and those of my clients every day. I believe that each and every one of us has this magic deep inside of us. I offer you my own experience and help you to harness your courage and compassion so that you remember your own unique magic and the place in the world that only you can fill. So that you rediscover the life your soul came here to experience. 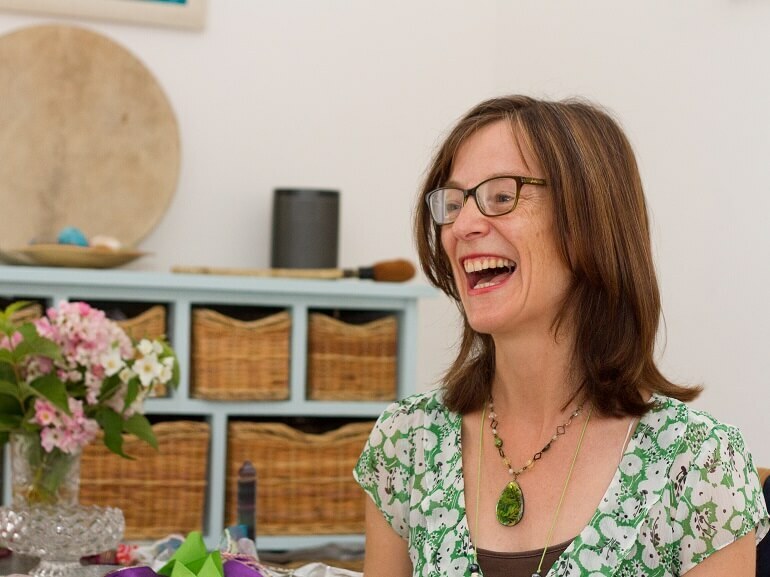 The journey that has led me to call myself the Midwife of the Soul began long ago but experienced a renewal when my second daughter Lottie was born in 2008, as I finally stepped out of my career and security towards the call of my soul. Lottie’s birth was the most profound and beautiful experience. I felt the life force of the universe travelling through me. I knew that all I needed to do was get out of my own way, silence my mind and allow my body and soul to take the lead. I birthed Lottie in a pool in my living room with a fire blazing in the hearth. My midwife provided careful preparation, companionship and a safely held space for me to unleash the magic of my body and of the new life coming through me. It transformed me. I am no longer the same person. This is what I now do for you. I create that same safely held sacred space for you to remember your power and your magic just as I did on that day almost 10 years ago. I hold you after that birthing process too – as you and your soul get to know each other more intimately just as Lottie and I did in those first few days and weeks together. It is an honour and a privilege to do this work and I feel that my whole life has been preparation for this calling, this deep soul work. I blend my deep experience of a decade as a Human Potential Coach with the five elements, feminine cycles, ritual and ceremony in a unique and beautiful way that best serves each awakening woman who crosses my path. Each interaction is infused with those super-powers disowned in my childhood – healing, empathy and intuition and what I can now see as the sheer beauty and power of being a woman on Earth at this crucial time in history. You have the magic within you. You ARE the magic, I simply create and hold the space for your transformation to take place and to integrate fully into your life here on Earth. Years ago my meditation teacher challenged me to imagine a life in which I was able to receive everything I needed to be the highest version of myself. So that I could truly own my gifts and be of service. Try it for yourself – it helps to silence all the thoughts of “it’s impossible” “I don’t deserve it” “I will never be able to afford that”. Just relax and dream… As I did so I tuned into a picture of being surrounded by nature, tuned into the elements, warm and comfortable with little luxuries like soft textures, the scent of flowers and wholesome food. This summer this vision came true for me and my family as we completed 3 years of hard work towards creating our dream home and garden. This is the space I welcome you into when you choose to work with me. From the comfort and warmth of my therapy room to the views of the water and the forest this is a place to feel safe, nurtured and held. The garden too has it’s magic and delights. We are creating it in full co-creation with Nature, with a wildlife pond, bee friendly planting and a completely organic approach. It’s the perfect place for your own personalised ritual and ceremony too, with a fire-pit to sit by and in which to release that which you no longer need, an arch of willow to transition through and a babbling brook to cross over as you claim your gifts and power as an awakening woman. I share this space with you gladly and with an open heart. It is a magical place and touches all those who come here.